If you thought price comparison type online marketplaces were a done deal, you’re clearly mistaken. Motorway, a new startup from the team behind Top10 — the mobile and broadband comparison site that exited to uSwitch in 2011 — are back again, and this time they want to make it infinitely easier to sell your used car online. To help with that mission, the young company, which formally launched in July 2017 after it had tested an MVP, has raised £2.75 million in seed funding led by LocalGlobe, and Marchmont Ventures (the VC fund of Hugo Burge, former CEO of Momondo, which sold to Priceline last year). Zoopla founder Alex Chesterman also participated. Motorway had previously raised an angel round of £500,000 in the autumn of 2017 after the product had launched and was showing traction. Angel investors in that round included Duncan Jennings (founder of VoucherCodes.co.uk), Shakil Khan (early Spotify investor) and Christian Woolfenden (CEO of Photobox). Tom Leathes, Motorway co-founder and CEO, says there are more than 8 million used cars sold annually in the U..K — which is more than 3x the number of new cars sold, apparently — but that the process of selling a car has gone largely unchanged for decades. This sees motorists having to visit multiple car dealers to negotiate a sale, or list privately on websites like AutoTrader or eBay. The other option is to use one of a number of online car buyers, such as WeBuyAnyCar, that provide a quick disposal option but in return prices paid are typically low. The London-based startup wants to provide a fourth option. 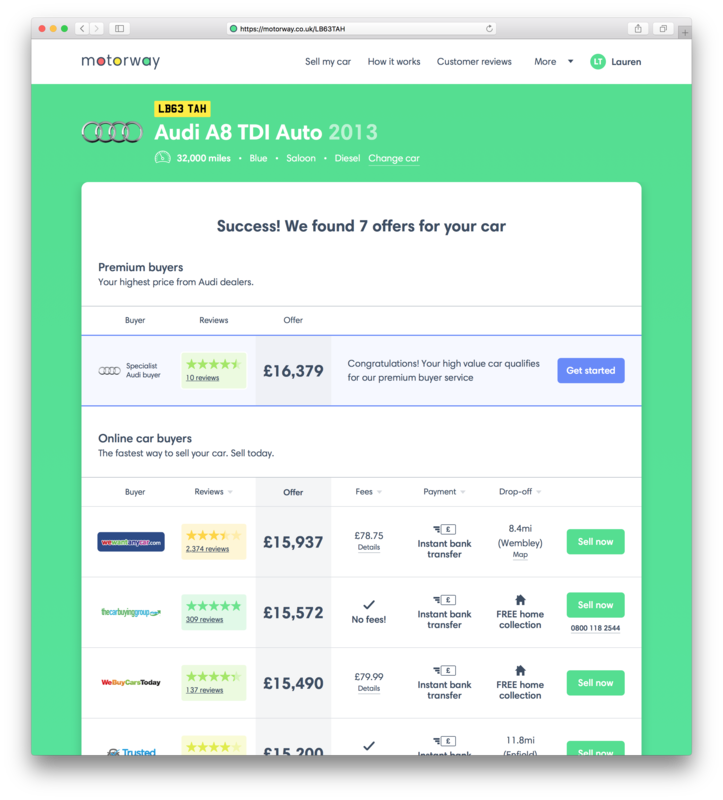 Namely — in classic price comparison fashion — Motorway makes it simple to compare the market and find the best deal for your car. In return, dealers get connected with motivated sellers instantly. Always be closing, as they say. “Motorway makes selling a car faster by bringing the options online and enabling easy price comparison,” says Leathes. “Consumers enter their car’s registration number and mileage to instantly see multiple offers from car buying services, specialist dealerships and even vehicle recycling firms. They can then compare headline offers, read buyer reviews, collection criteria, fees and payment methods before choosing their best deal. By comparing offers, consumers can get up to £1,000 more than going directly to one buyer, and sell their car in 24 hours”. In terms of typical customer, so far Motorway seems to have run the whole gamut of car owner. I’m told customers using the site have sold lots of Fords, Audis, VWs and Vauxhalls of all ages as well as Aston Martin DB9s, Porsche 911s and various Ferraris. “We’re building Motorway to help anyone looking to sell a car they own – no matter how old, its mileage, what brand or where it’s located,” adds the Motorway CEO. Leathes cites competitors as established brands such as Auto Trader, We Buy Any Car, eBay and Gumtree, which are popular websites in the U.K. to sell your car. He says there are also a couple of early-stage startups in the space, but that none of these services offers a transparent price comparison experience with instant offers to buy your vehicle. The revenue model is simple, too. The startup is paid a commission by the buyer when a car is purchased from a seller that found their offer through Motorway. “This means we’re aligned squarely with both consumers and car buyers, as we only make money when we successfully connect sellers with buyers and a deal is completed,” Leathes says. “Motorway’s goal is to help everyone find great offers for their car instantly. There’s a real perception that you need to be a car expert to get a good deal, and we think that needs to change”. With over 25,000 customer sales enquiries per month, Motorway says the new funding will enable the startup to further develop its software platform, expand the network of buyers, and to market the service more widely. Adds ​Suzanne Ashman, Partner at LocalGlobe: “Creating a compelling experience for people selling their cars is hard. The potential buyers are fragmented with many different online and offline options. Information about the sale process is difficult to find and pricing is often unclear. Motorway’s technology is exceptional and will bring much-needed transparency for car owners”. Despite having three successful (or at least, moderately successful) exits behind them, the Motorway founders are used to doing hard things. A fourth venture — a hotel comparison site launched after they successfully bought back the Top10 domain name and subsequently backed by Accel and Balderton — shut down in 2015. “Having had three successful startups before Top10, it was obviously a tough outcome for all of us. We built an amazing product and had decent growth, but it wasn’t 10x better than the competition, which it had to be to win in such an established market,” Leathes tells me. “After that we took almost a year working on ideas before deciding on Motorway. And we were pretty ruthless about launching something ourselves, proving it works and scaling it before raising any funding”.